With so many types of feed, grasses, and supplements available, it can be hard to figure out what you should feed your horse. We all know that good nutrition is important for keeping our horses healthy and happy, but how do we choose among all the different options? I’ve come to realize that a holistic approach is just as useful when looking at nutrition as when treating illness.Holistic means looking at the big picture and always asking why. When I first tried to utilize nutrition in my practice I was very frustrated because I did not approach it from a truly holistic standpoint. I looked at vitamin, mineral, and protein requirements; but I tried to make everything fit into a nice box. I found the Nutritional Research Council’s tables for daily requirements and I compared those to the ingredients in foods and supplements I gave my patients. But, despite all my careful calculations, my patients did not get any healthier. 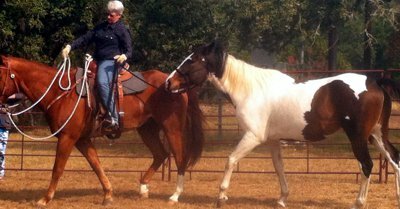 I finally came full circle several years later when I learned that horses, like all animals, need a wide range of whole food nutrients. Their bodies can then “sort through,” absorb, and assimilate what they need, and that may vary from day to day. While this approach seemed less scientific, the evidence I saw in my patients proved that it worked. 1. Not enough quality nutrients. 2. Failure to absorb and assimilate nutrients. 3. Free radical damage due to the build up of metabolic and environmental toxins. 4. (I feel there is one more:) Body energetically out of balance. Alternative modalities such as homeopathy, acupuncture, chiropractic, and other forms of energetic healing, including prayer, address this major area of health. All of these modalities can be greatly supported by the proper approach to nutrition. For high-quality nutrients, one has to turn to whole foods. Synthetic vitamins and inorganic minerals will not support healthy bodies. Building your nutritional program around synthetic nutrients is like building your house out of Styrofoam bricks. Everything looks good until there is some kind of stress, then the whole world comes tumbling down. Because most of our foods are produced by the use of synthetic fertilizers; they will not provide us with high quality nutrients. Oats and grass once provided all the nutrition hard working horses needed, but that is not longer the case. Many low-level chronic health conditions are becoming common due to sub-optimum nutrition. I will cover a few of these and offer nutritional support suggestions. Many of these conditions are accepted as normal, which means people have learned to settle for less-than-excellent health. None of these are normal; they are all signs of chronic poor health.